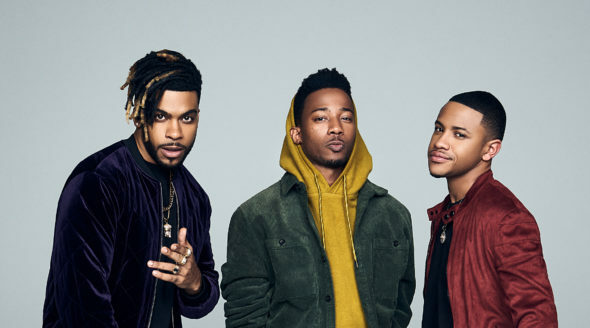 Are Bryson and Simone making a good go of it during the first season of the Boomerang TV show on BET? As we all know, the Nielsen ratings typically play a big role in determining whether a TV show like Boomerang is cancelled or renewed for season two. Unfortunately, most of us do not live in Nielsen households. Because many viewers feel frustration when their viewing habits and opinions aren’t considered, we’d like to offer you the chance to rate all of the Boomerang season one episodes here. *Status update below. A serialized BET sitcom, Boomerang stars Lala Milan, RJ Walker, Leland Martin, Tetona Jackson, Tequan Richmond, and Brittany Inge. From executive producers Halle Berry and Lena Waithe, the TV series is a sequel to the 1992 romantic comedy feature film of the same name, starring Eddie Murphy as Marcus Graham, Robin Givens as Jacqueline Broyer, and Berry as Angela Davis. The comedy follows Jacqueline’s son, Bryson (Richmond), and Marcus and Angela’s daughter, Simone (Jackson), as they try to forge a path outside the shadows their parents have cast and make their own way in the world.